Without a doubt, the single-most unifying element in Southwest New Hampshire is Mount Monadnock. Standing well above everything in the region, at 3,165-feet, Monadnock is an ever-present influence and can be seen from practically anywhere. Besides being the most popular mountain in America, Grand Monadnock is known as the most climbed mountain in the world. That doesn't mean you won't find some quiet areas to enjoy alone on the mountain. Just don't expect to be alone when you reach the summit, especially during foliage season when the colors paint the entire region in lush shades of red and orange. Henry David Thoreau, Ralph Waldo Emerson, Mark Twain and many others hiked this mountain and endorsed it in their writings as a symbol of spiritual and environmental awareness. Since those days, many thousands of hikers from throughout the world have discovered this treasure. Mount Monadnock was designated a National Natural Landmark in 1987. There are forty miles of clearly marked foot trails, many of which lead to the bare rock summit through unique alpine vegetation. Unsurpassed 100 mile views to points in all six New England States are the reward for the climb. Mt. 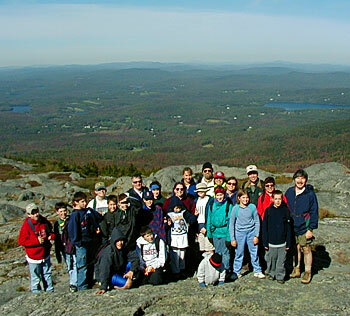 Monadnock has five major hiking trails that lead to the summit.